Please see information at the bottom of this page to determine League Age for 2017. For Boys and Girls in Kindergarten and last year of Pre-K (Ages 4-6) who want to learn the fundamentals of hitting and fielding. Players bat off a batting T. Each team bats their entire roster each inning. There are two practices a week during the pre-season and two one-hour games a week during the season (typically one of the games is on a Saturday). A (formerly Rookie) - For players in 1st grade. Typically age 7 with a limited number of age 6 players. Players continue to learn the fundamentals of hitting and fielding while being introduced to the rules of the game. Machine pitch challenges the players to hit a pitched ball. 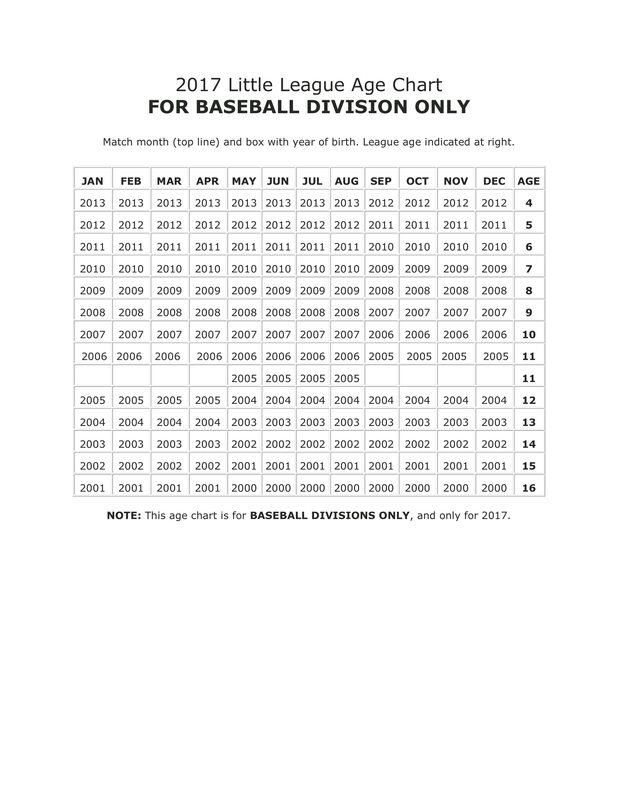 Players who are a league age 6 must have one year of T-ball. Starting in 2015, players DO NOT need to attend a skill evaluation to be considered for this division. There will be two practices a week during the pre-season and one practice during the week and one game on a Saturday during the season. AA (formerly Central) - For players in 2nd and 3rd gade. Typically ages 8-9 (limited number of roster spots for exceptional 7s) This league builds on the fundamentals of hitting, fielding, and introduces the players to pitching. Players will hit off a machine for the first 4 innings of the game and then it will be player pitch for the last two innings. After the mid-point of the season, it wil be three innings of machine pitch and three innings of player pitch. The rules of the game are further emphasized and umpires are introduced at this level. Players must attend a skill evaluation to be considered for this division. There will be at least two practices a week during the pre-season and a practice and 2 games a week during the season. AAA (formerly Coast) - For players 9-11 years old. This league continues with the building of fundamental skills and rules of the game. Players pitch for the entire game. Players are eligible to participate on All Star Teams. Players must attend a skill evaluation to be considered for this division. There will be 2-3 practices a week during the pre-season and a practice and 2 games a week during the season. Majors - For players 10-12 years old. Games are played by the official rules of Little League Baseball. All players are eligible to be selected to the All Star Team that competes for the Little League World Series in Williamsport PA. Players must attend a skill evaluation to be considered for this division. The number of events is typically 4-5 per week. Juniors - For players 12-14 years old. This program offers a link between Little League and Senior League divisions. There is a full range of tournament play. Senior League - For players 14-16 years old. This division offers a full range of tournament play and a World Series.